The AHT Electric Underfloor Heating system has been chosen by Chr. 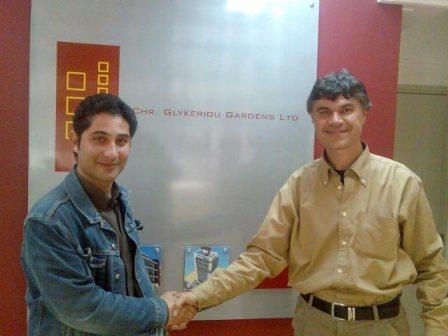 Glykeriou Gardens Ltd for its new Dasoupolis Gardens housing estate in Strovolos, Cyprus. The contracts for the supply and installation of the system were signed by Mr Demetris Astaniotis (left) on behalf of Chr. Glykeriou Gardens Ltd and Mr Kyriacos Bilicos Managing Director of OPUS Electrical Technologies Ltd representing AHT Ltd in Cyprus. The unique amorphous metal technology of the AHT system allows its immediate installation under any type of floor and offers among up to 50% savings in terms of capital and running costs; it is ecologically friendly, with no need for boilers, radiators. It offers extremely low maintenance and is immune to mechanical breakdowns. For these reasons many leading construction companies in Cyprus, such as Cosmo Developers, Giovani Developers, Chr. Rotos & Sons, P. Parpas Constructions, Venus Developments, Petrabuild, GSK Herodotou, Medousa Constructions, Romalea Investments, G & V Hadjidemosthenous Developers etc, have already chosen the revolutionary AHT system for their projects.